When you are searching for the perfect bike for your son or daughter or even your grandchild, you can become overwhelmed with choices. 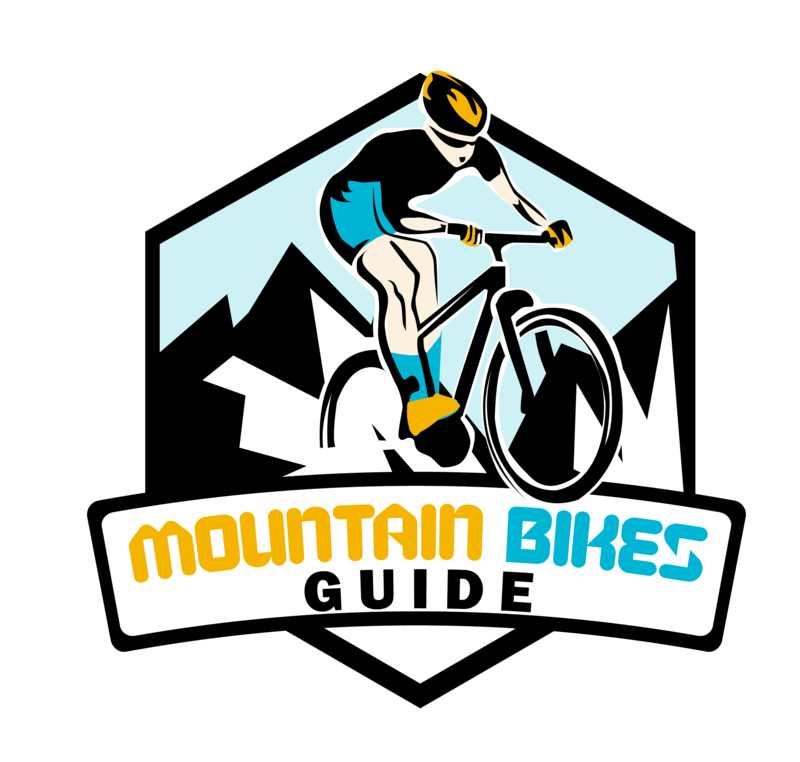 For those looking to save money and purchase a high quality mountain bike, you will be sure to find the perfect mountain bike listed within the best mountain bikes for kids. If your son or grandson is in need of a mountain bike, look no further than the Diamondback Cobra. The six gear shifters allow for maneuvering through grass, mud, and gravel and the 20’’ tires help the rider maintain control throughout the ride. The Diamondback Cobra will arrive about 80% pre-assembled, all you will need to do is add the front wheel, handlebars, seat, and pedals which can take a beginner about half an hour to build. In addition to the small amount for assembly, you will need to adjust the brakes accordingly. Once your youngster is out for a ride, they will fall in love. The Diamondback Cobra is easy to use and gives the rider great control. Although the steel frame is heavier than those made from aluminum, the durability of the frame will stand up to any type of terrain. The linear pull front and rear brakes will give the rider ultimate stopping power and the suspension travel on the front fork performs wonderfully. 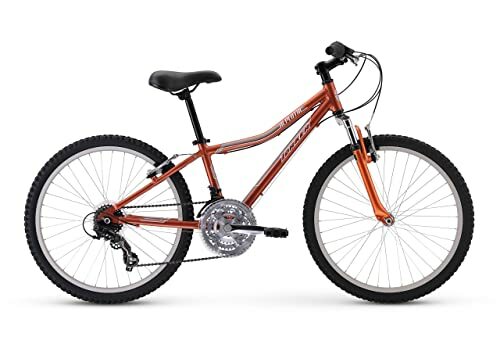 It can be difficult to find a mountain bike that has 20’’ wheels, so if your 5-10 year old is ready to begin training to ride off road terrain, the Diamondback Cobra is a great place to start. Furthermore, the bright orange color adds an extra uniqueness that kids love. For the girls that seek outdoor adventures, the Mongoose Maxim Full Suspension will enhance that experience. Ideal for 8 years and up, the Mongoose Maxim features a lightweight aluminum frame which will enable the rider to pick up more speed during the ride. By the same token, the grip shifters are the same ones featured on mountain bikes that cost upwards of $1200, which means the Maxim can give riders smooth and effortless shifting at a great value. Incredibly easy to assemble, you can put it together and have it ready for a spin in about 45 minutes. Just make sure you check the air pressure and align the brakes before heading out. The Maxim is fully adjustable and is ideal for girls ranging in height from 56’’ to 62’’ tall, although those who purchase just under the recommended height have no trouble riding and they have room to grow. Additionally, the Mongoose Maxim is great to take out on a variety of trails where you can put the durability to the test. 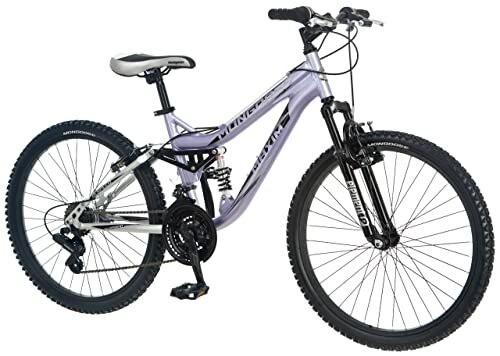 The unique design and lavender color are appealing to the eyes and many girls still find this bike quite feminine. All in all, the Mongoose Maxim Full Suspension mountain bike is a great piece of engineering and riders enjoy this bike from day one. The Diamondback Lustre is a great choice for girls ready to conquer more difficult trails. 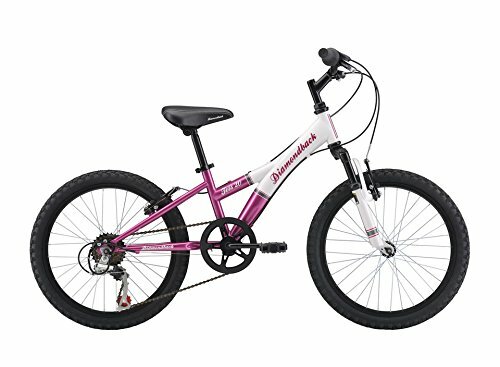 While the Diamondback Lustre is a fair bit heavier than other bikes this size, it is a durable machine that will endure any ride until your daughter or grand-daughter has outgrown it. Upon arrival, you will need to do minimal assembly, including adjusting the v-brakes, which is not a difficult task, but can be confusing if you are not familiar with the process. If you are in doubt you can visit your local bike shop for guidance or assembly at a fairly low cost. Consequently the gears can be a bit tricky for those not used to using gear shifters, but with practice, riders will soon be able to shift without any problems. The Diamondback Lustre will handle very well, whether it’s a steep incline or a descent, this bike will allow for great control and a comfortable ride. Due to the handling and ease of riding, riders can keep up with their parents on the trail and full enjoy a ride out with mom or dad. In the end, the Diamondback Lustre is a mountain bike perfect for the girl ready for more advanced trails or more challenging rides. The Mongoose Ledge is a great choice for 10-13 year old boys who are starting to hit trails harder and will need something more durable. The 21-speed gears shift from one to the other easily and precisely due to the Shimano rear derailleurs, enabling riders to ride on any type of terrain from grass to rough, rocky trails. Not to mention the full suspension creates a comfortable, smooth ride every time and the suspension fork lets the rider have more control. The Mongoose Ledge is lightweight and quite nimble because of the aluminum frame and excellent braking power. Most riders receive this bike as an upgrade which will allow for more difficult and rougher trails because of the high standards and long lasting durability. In conclusion the Mongoose Ledge is perfect for the boys who want to take their mountain bike to the edge of performance and look forward to riding again and again. 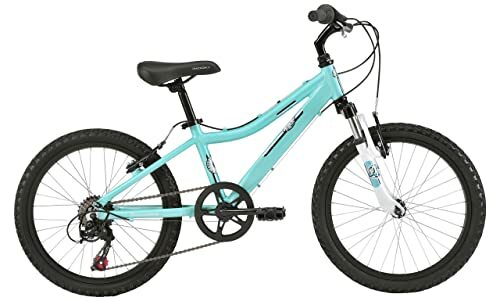 A Huffy Girls 24335 Alpine mountain bike is more than ideal for girls ready to move up in size or those looking to have a more mature bike. The precision steel hardtail frame is designed for durability and the 24’’ tires allow for controlled, yet agile riding. Equally important, the 18 speed Enzo twist shifters are easy to use and let the ride find the perfect gear for the terrain smoothly and quickly either uphill or downhill. In addition, the padded seat is quite comfortable for most which is ideal for longer rides. When the Huffy Girls 24335 Alpine is properly assembled (an easy task, even for novices) and adjusted, this mountain bike will be a joy to ride. 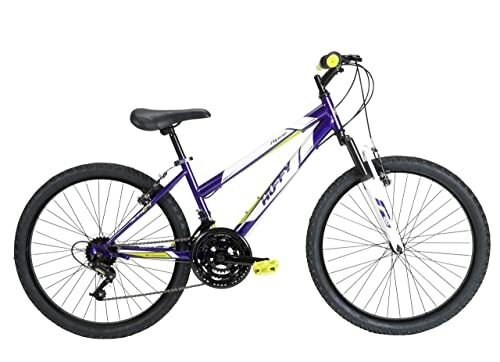 Altogether the Huffy Girls 24335 Alpine mountain bike is a well-designed and comfortable bike that is suitable for ages 9-13 and the metallic purple coloring is a well-loved favorite. The Diamondback Girls 2015 Tess Complete Hardtail will be a great choice for beginners in the 7-10 age groups. A sturdy and durable mountain bike with a high tensile steel frame, the Diamondback Tess is capable of almost anything. Its suspension fork will help absorb shocks from rough trails and the linear pull brakes are easy to operate, yet strong and able to stop quickly. Featuring a Shimano 7-speed drivetrain gives riders a wide range of gears and allows them to choose the exact gear they want depending on the type of trail. Of course, there will be some assembly required yet the very detailed instructions will be easy to follow and you can put the bike together in no time. The durability of the Diamondback 2015 Tess will stand the test of time, providing a solid and controlled ride throughout its use. In addition the more mature color design will last even through the many phases of style choices all girls go through. To conclude, the Diamondback Girls 2015 Tess Complete Hardtail is a mountain bike that will be capable and tough, even if it is pink. 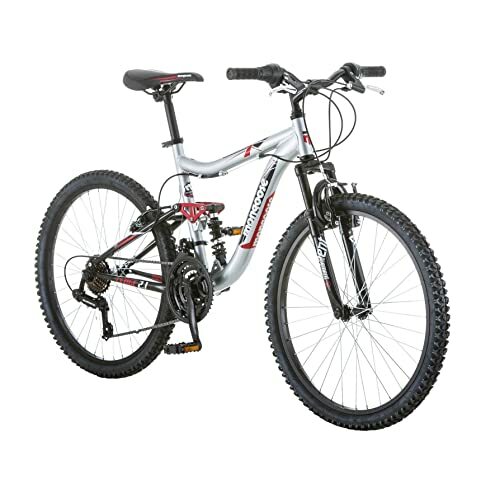 Another unisex mountain bike, the Diamondback Octane 20’’ is a super lightweight bike that many kids love to ride. The Octane is fitted with all name brand parts throughout the bike which signifies quality as well as ease in upgrading when the time comes. When it arrives, you will need to assemble the bike and many people find assembly of this particular bike to be a challenge. If you have a lot of experience with building bikes, it should not be a problem for you and can take as little as 30 minutes. For those who are not experienced, a local bike shop can get the job done quickly and accurately. When the Octane is assembled, the Shimano mechanical rim brakes are easily adjustable for your child’s needs, and have the ability to stop at a moment’s notice. Out on a trail, you will find that the Diamondback Octane rides quietly and smoothly with very little effort. The lightweight frame and suspension fork allow the rider to pick up speed and climb hills while absorbing shock from any type of terrain. Additionally, the Shimano 6-speed drivetrain will give your child a wide range of gears to choose from and when your child goes to shift, they can do so quite easily, even if this is the first bike they are riding that features gear shifts. Ultimately, the Diamondback Octane 20’’ will give riders a great experience on any terrain and with plenty of room to grow, this mountain bike will be a treasured favorite for a few years. 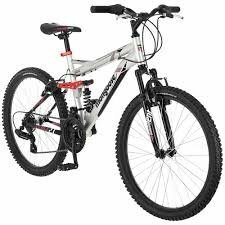 The Torker Alpental Boy’s mountain bike is a joy to ride and boys ranging from 7-12 all love the way the Torker Alpental handles on a trail. The 24’’ wheels closely grip the trail and allow for better control and handling. While the wheels provide great control, the 60mm travel suspension fork will absorb shocks from the bumps and debris on the trail, making the ride comfortable and seamless. The Torker Alpental is fitted with an aluminum frame that is a little heavier than others made from aluminum, yet this will provide riders a sturdy and durable mountain bike. Similarly, the ability to adjust the Torker Alpental is very simple and covers a wide range of heights which is great for a growing pre-teen. Moreover, assembly is a breeze and can take those with experience just 20 minutes and even those without previous experience find it only takes about an hour to put together. When the bike is trail ready and your child is out riding they are able to shift with ease due to the Shimano twist shifters, which is great for smaller hands. The ease of shifting will let your child choose the proper gear depending on what they are doing on the trail. When it comes time to stop, the alloy linear pull brakes will give you immediate stopping power if it is needed. 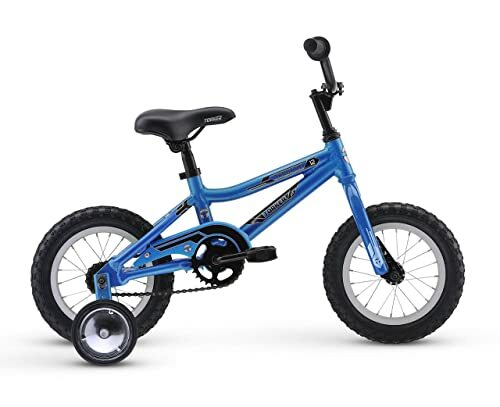 All in all, the Torker Alpental mountain bike will give your son or grandson an effortless and fun ride and the durability will prove to last through their childhood years. The 2015 HASA 18 Speed is an amazing deal for the quality components fitted in this mountain bike. 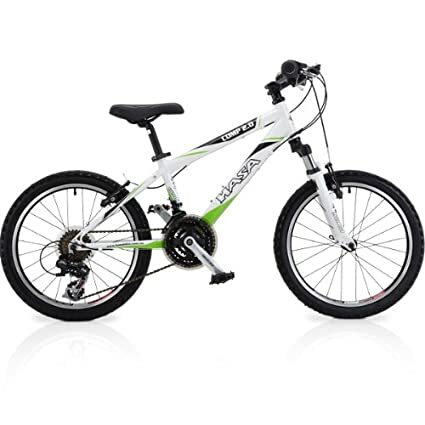 It is a unisex bike so it can appeal to any child who wants to have a great mountain bike. While HASA is not as well-known as other brands, it is quickly making a name for itself within the market as one of the best bikes around. The HASA aluminum frame is welded very well and is super lightweight. The suspension has superb performance as it absorbs the many shocks a rocky or rough trail will throw its way. Furthermore riders are able to shift through 18 gears as the HASA shifting components are the high quality, well known Shimano SL-RS35 with left 3 speeds and right 6 speeds. No matter if you have a girl or a boy, whoever is riding the HASA will not want to stop. This high quality mountain bike provides a safe, fun, and exciting ride as it can handle any sort of terrain and can do so effortlessly. Additionally the HASA is extremely easy to assemble and you can take it for a spin in as little as 30 minutes after it arrives. Consequently the tires fitted on the HASA seem to wear down quickly, but this is the only downfall to purchasing this mountain bike. Even still the HASA name is becoming a household one and it does not disappoint. 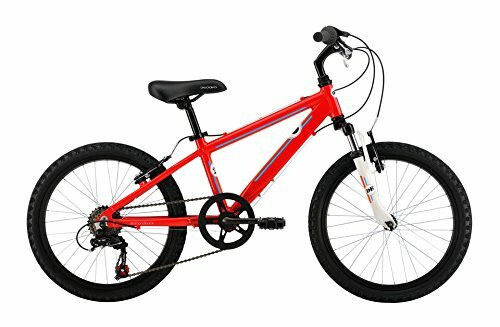 In summary, if you want to provide an amazing ride for your child you can do so with the high quality and low cost of the 2015 HASA 18 Speed mountain bike. The Torker Throttle boy’s mountain bike is a perfect choice for riders who want to begin riding a bike that provides more challenges. Even if your child still requires the assistance of training wheels, learning how to maneuver a larger bike will give them the skills they need when they finally make it to an off road trail. The Torker Throttle has an aluminum frame and the lightweight frame will be easier for younger riders to handle. Similarly when the Torker Throttle arrives, it will be nearly fully assembled and the minimal assembly you will need to do will only take about 30 minutes so you can get your little one outside riding sooner. When your child is out riding, they will find the mechanical rim brakes easy to use and very reliable. Not only is the Torker Throttle reliable, this mountain bike is also quite sturdy and will endure through the crashes, rougher riding, and growth spurts. 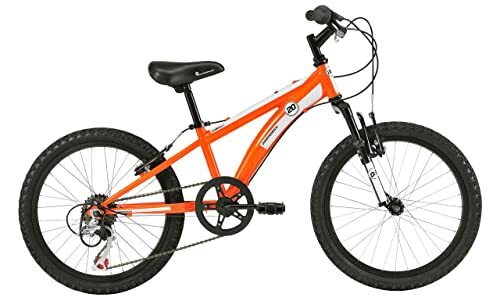 Furthermore the low cost and high quality components put the Torker Throttle mountain bike ahead of its competition when you are searching for the perfect beginner bike. In the end, your son or grandson will be more than happy with the performance and ease of use of the Torker Throttle and will enjoy riding this bike every day. When you begin your search for the perfect mountain bike for your son, daughter, or grandchild the best mountain bikes for kids will help to narrow down your selection. Amongst the best mountain bikes for kids you will find quality, high performance standards, and name brand components, will allow for a fun and enjoyable ride, without breaking the bank.